Garden pots are a popular and important layout element for your outdoor living space. Garden pots can easily lend a whole new atmosphere to open spaces and transform them into quiet green oases. Plant pots can structure your garden or patio and be used as beautiful and elegant borders to create secluded spaces outdoors. Not only do they reflect the owner’s personal sense of style and design, they also welcome friends and family and make them feel right at home in the garden. Extra large garden pots made in Italy transform the garden into a classical Roman garden. Our designer flower pots are available in a wide range of different styles, sizes and materials. Chalices in cast iron give your garden a Venetian look, while glazed stoneware in blue makes for a fantastic addition to your pool area and creates a Caribbean holiday feeling. Pots are available from glazed stoneware to natural cast iron with a transparent finish. Amphoras are ideal for decorating staircases or patios. A flowerbox in graphite coloured iron fits into every environment and garden style from classical to lounge or modern. Outdoor garden pots are eye catching in every garden area, on the patio or the balcony or in the conservatory. Their high-quality Italian design and the premium materials used have a light and playful Mediterranean touch. 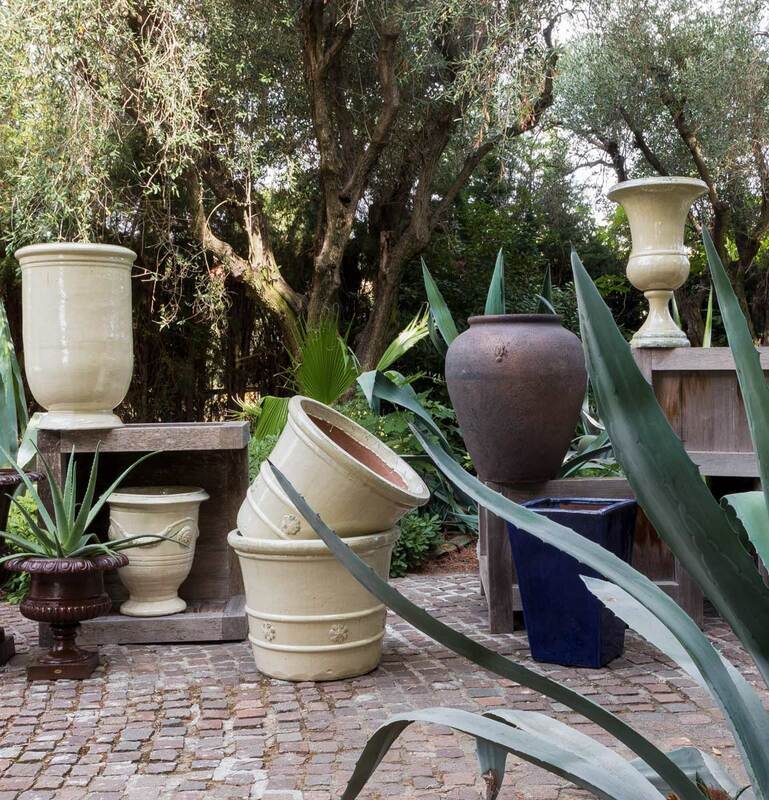 Our designer garden pots are manufactured in Italy according to traditional Italian craftsmanship. Fresh flower bouquets, floral arrangements or branches make for sensuous highlights and transform the open spaces outdoors into an extension of the living room. Their sight evokes images of the Italian sun. Additionally, they are also practical and can not only be used for plants but can also double as magazine racks or for other uses. Unopiù’s garden pots stand for style and hospitality and fit in harmoniously with the outdoor area furniture. They not only complement the outdoor’s style and elegance, they enhance and underline it.